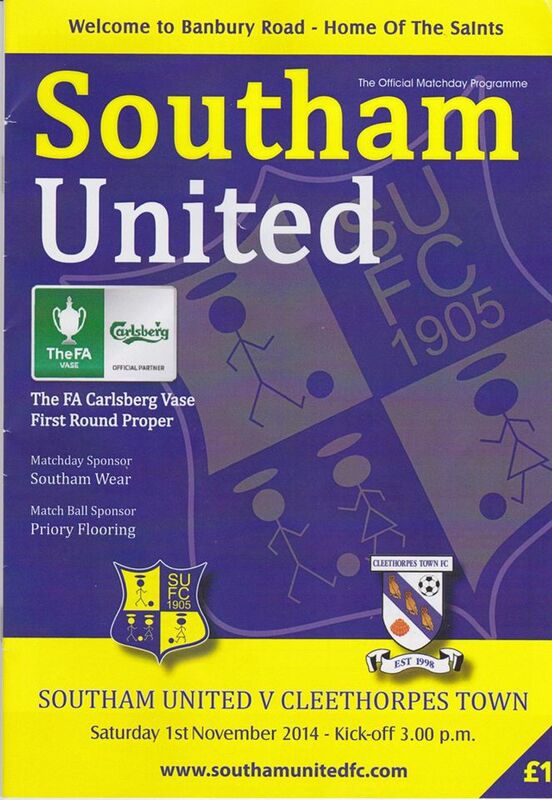 Southam United were formed in 1905. They played in local leagues around Coventry and Warwickshire for the first 75 years of their history, joining the Midland League in 1980. The first few years of this brought mixed success with them moving around the divisions, but since 1995 they have been a permanent fixture in the Premier Division, finishing as runners-up twice. In 2008/09. they got to the FA Cup 2nd Qualifying Round, beating Boldmere St Michaels, Lye Town and Gornal Athletic, before losing to Atherstone Town. On every other occasion, they have exited at the first hurdle. In the FA Vase they reached the 2nd Round in 2012/13 so today would give them a chance to at least match that, should they win. Before the game they were mid-table in the Midland Football League, having finished 10th in the Midland Football Combination last season. Originally on this day, the plan was to do a double of Hythe Town v Guernsey and then another game at 3PM. Guernsey's games are very often kicked off at 12.45PM due to them showing it live on TV on the island. It would also give me a chance to meet my mate Louis who supports Hythe. But then the FA Trophy intervened and prevented the game going ahead, with it being scheduled for another day. In any case, I had spotted another potential meet. Southam United were playing Cleethorpes Town in the FA Vase, and the visitors were offering a free coach. As most of my Grimsby supporting pals lived up that way, they said they would all come down for the game, and so it would represent a good opportunity to catch up. The draw for the FA Trophy was supposed to be regionalised as far as I know, but this draw represented a long 240-mile round journey for the men from North Lincolnshire, whilst I would only be having to do half of that mileage. I'd been to a game on the Friday night before the game at Barton Rovers in the FA Youth Cup as they lost 2-0 to AFC Sudbury. It was only a revisit, but at least I picked up a teamsheet this time, which was my main objective, having not got a programme from my last visit. I stayed up quite late watching TV and looking on the net, so I only got 4 hours sleep, getting up at 8am. After a shower and breakfast, I started researching for this blog and saw that Southam United were getting a new ground within a few years, so I was glad to get this one in while I can. I had to take my 'old' phone in to be fixed down in Wycombe, so I left around 11.45am. I took it in, and after briefly talking to the guy in there, I dropped it off and he said to come back in 90 minutes. I told him I would be back next week as I had to get off. I went to Poundworld to get a few bits for the game, before walking back to my car. It was 11.50 by the time I left, good progress was made up the M40 and I was at the ground just after 2. I paid my fiver to get in, and also got a well-presented programme for £1. First port of call was the bar, where I got a pint of Magners for £2.80. I stuck to the one as I was driving, and certainly did not get as drunk as Mark who I met for the first time. He was bladdered last night and was sick over a lad called Lewis, who I met the last time I saw Cleethorpes play last year. I had a go on the halftime football card draw, picking Wycombe and chatted further to the travelling Clee Army. For the game, we took our place in the back row of the big stand and had a bit of a sing-song. I stood next to my good mate Kieran for the game, and we had a good old chat about football. It was a happy day for us both because as well as Clee winning, both Wycombe and Grimsby were victorious too. As for the game I was at, I did have a match clipping from the non-league paper, but this has been lost over the years and I no longer have the scan. I did manage to find one on the Cleethorpes Town website, with the visitors recording a comfortable 5-1 victory. After the game, I said my goodbyes to all my mates. It was sad to leave them and I wish we lived nearer, especially Kieran who also likes groundhopping as much as me. But it was good to catch up with him and William, and also meet Robert, Mark, Sam, Bam and Chris for the first time. The journey home was just as good as the journey there, and I was back home by 6.10. I had dinner, then spent the rest of the night relaxing before the weekly ritual of Match Of The Day.